Y’all know I’m obsessed with eggs. You may also know about my undying love for sriracha (I don’t care if it’s been over done, I still love it!!). So it’s only natural that I make Sriracha Egg Salad. 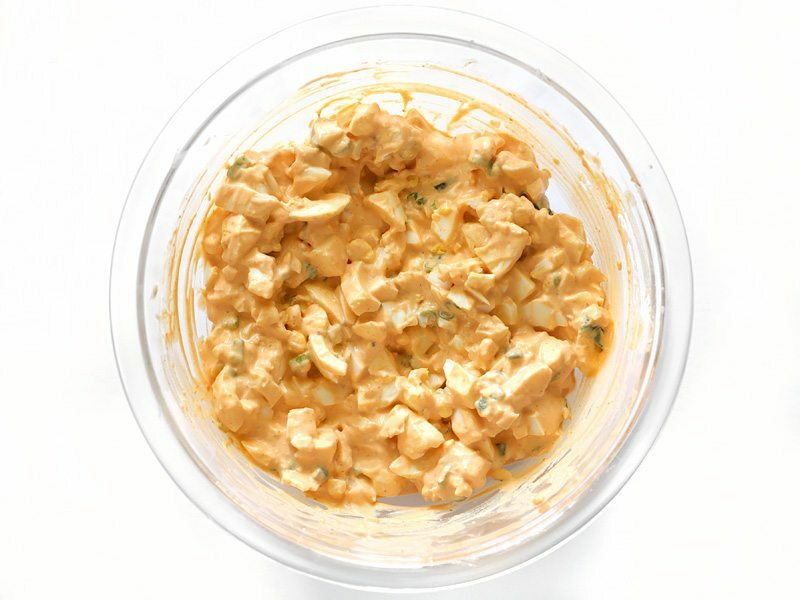 I talked a little about Sriracha Egg Salad in my post for Sriracha Deviled Eggs, but I wanted to make a recipe specifically for this simple yet delicious recipe. The Sriracha deviled eggs are a bit “heavier” in flavor thanks to the smoked paprika and garlic powder, but you’re also probably eating one or two halves (…probably). 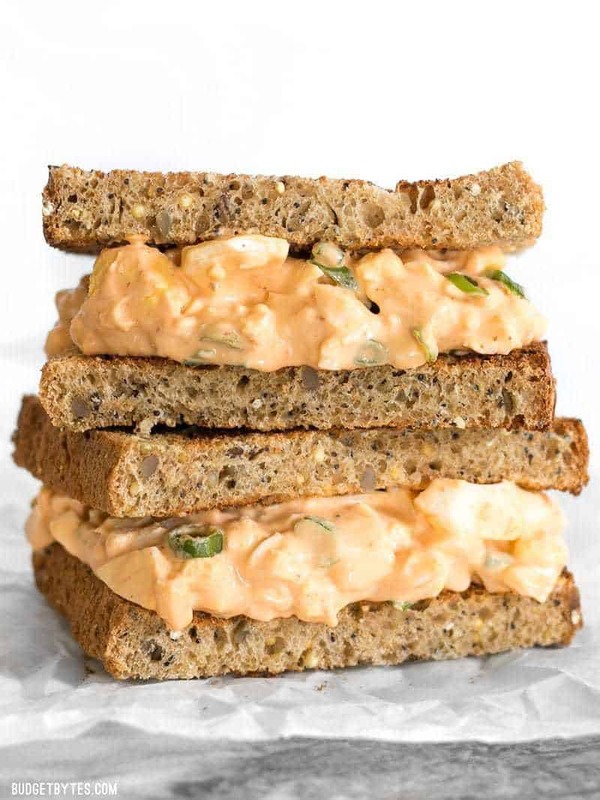 Chances are you’ll be eating a little bit more of the egg salad so I wanted it to taste a little lighter and more fresh. So I kept it simple, added a little lemon juice to lighten it up and make it even more tangy. I’ll admit that I’m picky about my eggs and I do pay for the more expensive brand, so it’s quite possible for this recipe to be even less expensive than it cost me below. I only priced out the egg salad because there are several ways you can eat this. Sandwiches are the classic preparation, but you could also dip in your favorite crackers, stuff it into a pita instead of two slices of bread, wrap it up in a tortilla, or even place a scoop on top of a bed of greens for a low carb lunch. No matter how you serve it, it’s creamy, rich, tangy, and delicious! 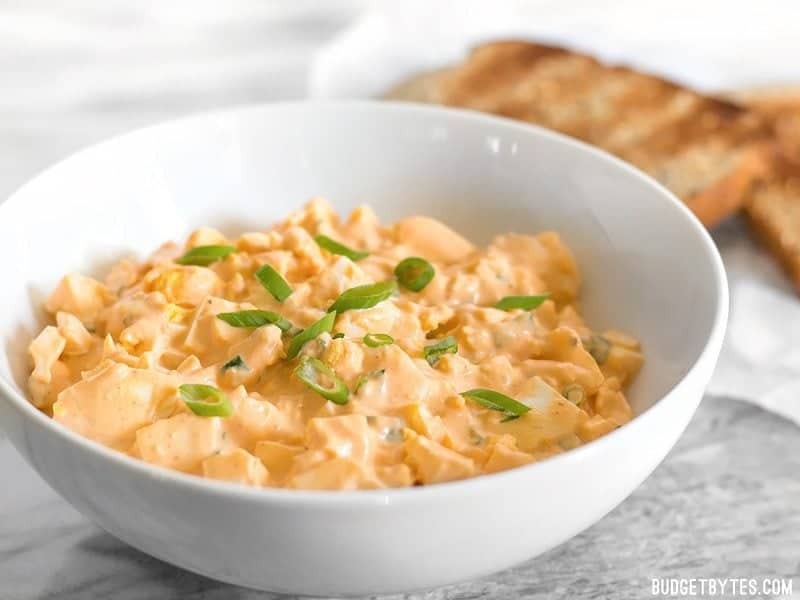 Sriracha Egg Salad is a simple yet satisfying quick dish that boasts a creamy, tangy, and spicy sauce. 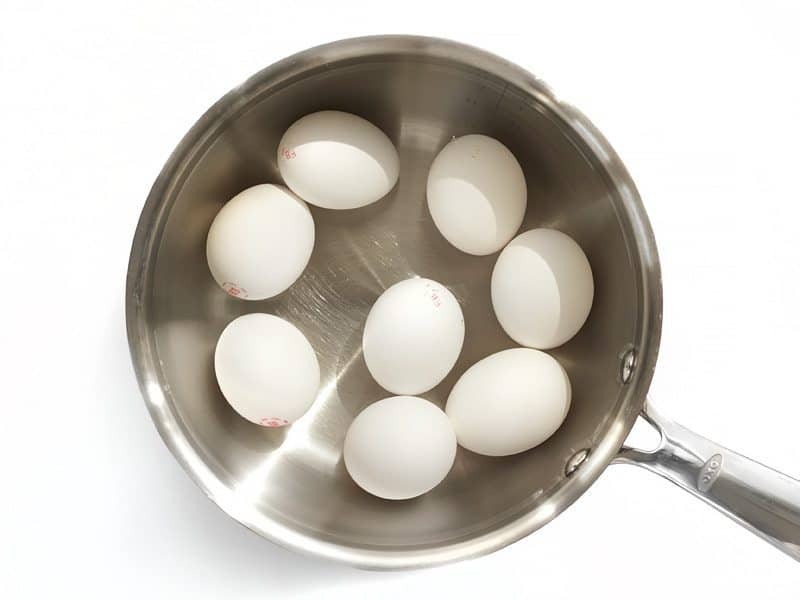 Place the eggs in a large sauce pot and add enough water to cover them by one inch. Place a lid on the pot and bring to a boil over high heat. Once it reaches a full rolling boil, turn off the heat and let it sit with the lid in place for 15 minutes. After 15 minutes transfer the eggs to an ice water bath to stop the cooking process. Let the eggs sit in the ice water for 5-10 minutes before peeling. While the eggs are cooking, prepare the dressing. 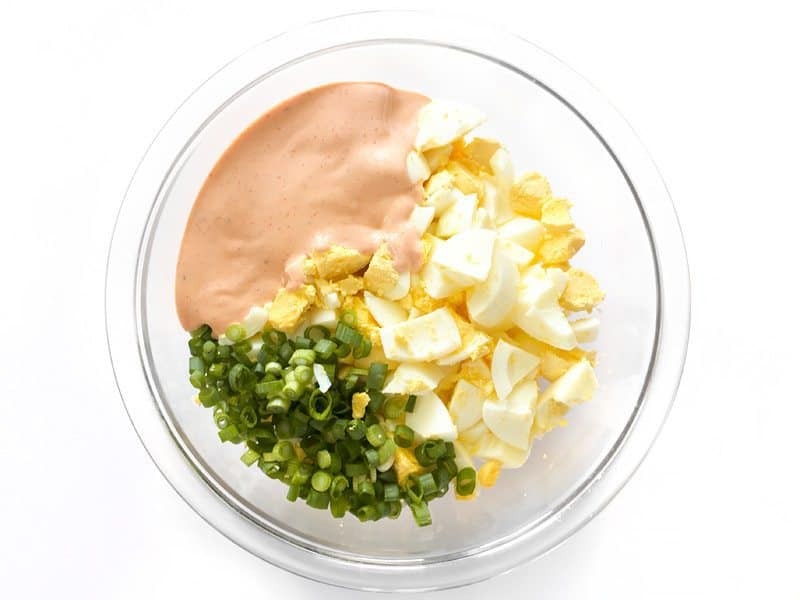 Combine the mayonnaise, sriracha, salt, lemon juice, and some freshly cracked pepper in a bowl. Finally, slice the green onions and peel the eggs. Coarsely chop the eggs, place them in a large bowl with the sliced green onions, and pour the dressing over top. Stir to combine, then serve or refrigerate until ready to serve. Start by hard boiling 8 large eggs. Place the eggs in a sauce pot and add enough water to cover by one inch. Place a lid on the pot and bring it to a boil over high heat. Having the eggs in the pot as it comes up to a boil helps prevent them from cracking. Once the pot reaches a hard rolling boil, turn off the heat and let them sit in the hot water (lid on) for 15 minutes. 15 minutes is the time needed for LARGE eggs. If you’re using a different size, you may need more or less time. At the 15 minute mark, transfer the eggs to an ice bath to stop the cooking process (this will help prevent green yolks). 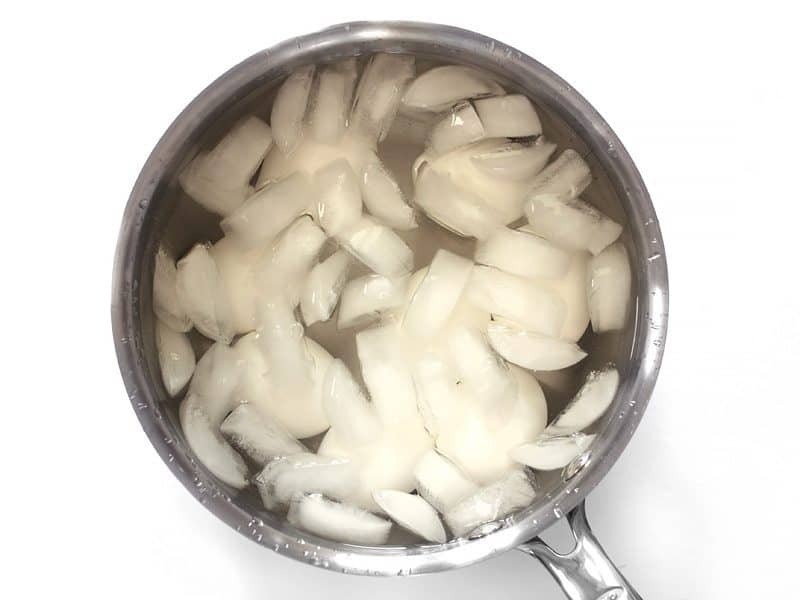 I like to just carefully pour out the hot water from the pot, add a TON of ice, and then enough water to cover the eggs. Let the eggs sit in the ice bath for 5-10 minutes. While the eggs are cooking, prepare the salad dressing. 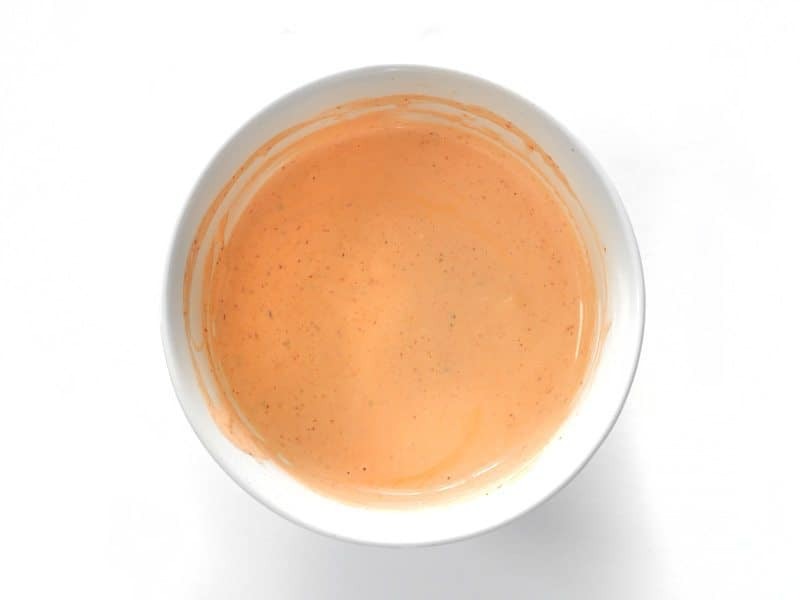 Stir together 1/2 cup mayonnaise, 2 Tbsp sriracha, 1/4 tsp salt, 1/2 tsp lemon juice, and some freshly cracked pepper in a bowl. Slice two green onions. Peel and roughly chop the boiled eggs. I like to leave my eggs slightly chunky as they will break down a bit more as you stir the salad. 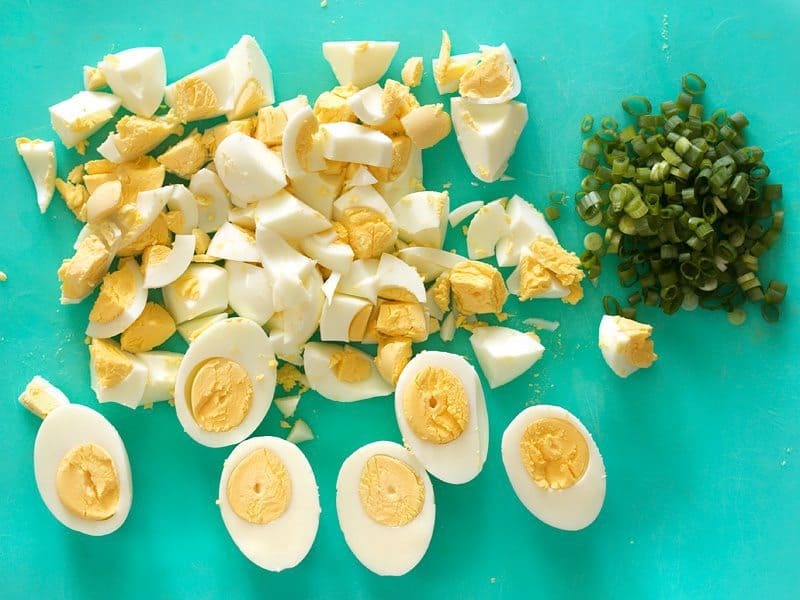 Place the chopped eggs, sliced green onions, and dressing in a large bowl. (you can start with less dressing and add more to your liking after stirring everything together). And then stir to combine. EASY! The dressing will appear kind of pink-ish at first, but will turn more orange-y as it mixes with the egg yolks. 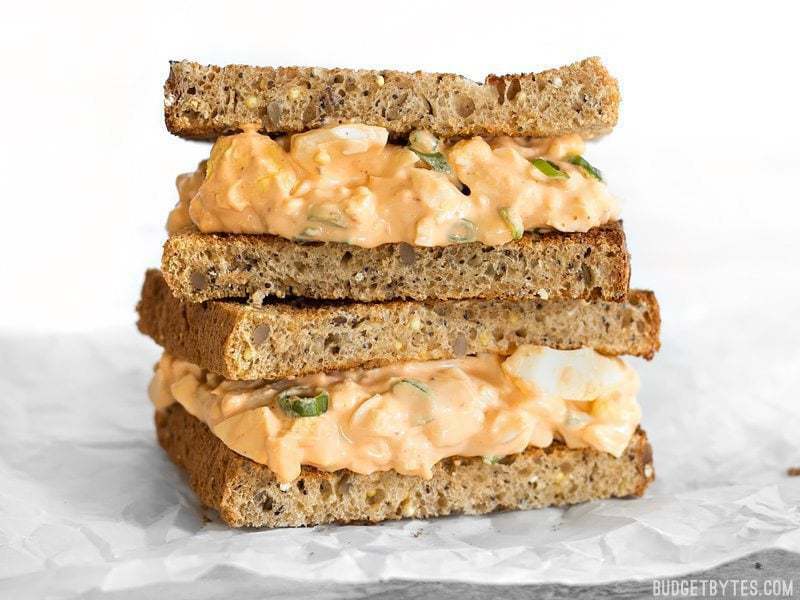 Serve the Sriracha Egg Salad immediately or refrigerate for later. I’m trying to cut back my sugar intake, and this was great in that respect along with being cool and refreshing for summer! In the past I’ve always used pickle relish in my egg salads, but this didn’t need it at all and was great as it was. I didn’t have sriracha (we used it up before making the recipe, oops). But so I just added a little more light mayo. I ended up doing the egg salad over fresh spinach with chopped tomatoes, basil, salt and pepper. Omg! 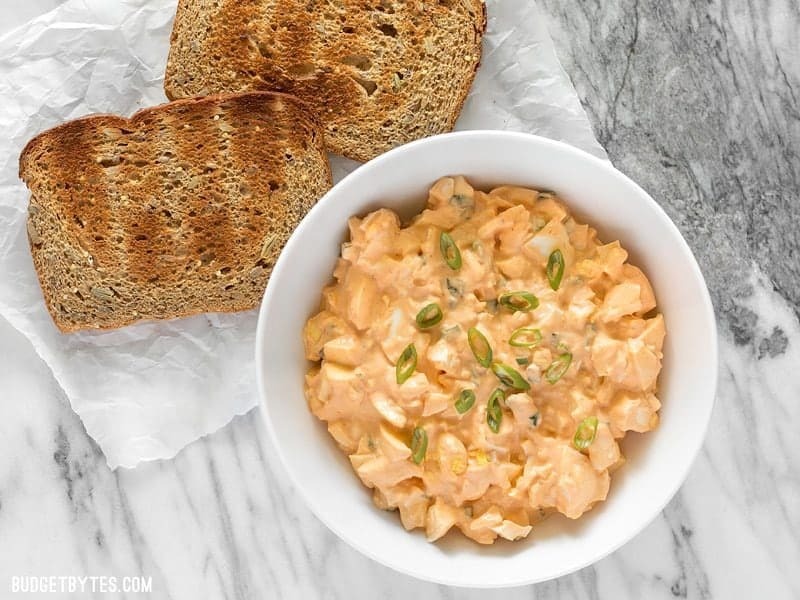 I love egg salad.. but…this Sriracha Egg Salad is delicious!! I added one tablespoon of sandwich spread and one less tablespoon of mayo. I added a few chopped white onions. Didn’t have lemon juice. :( but it all turned out delicious! My husband loves it!! !